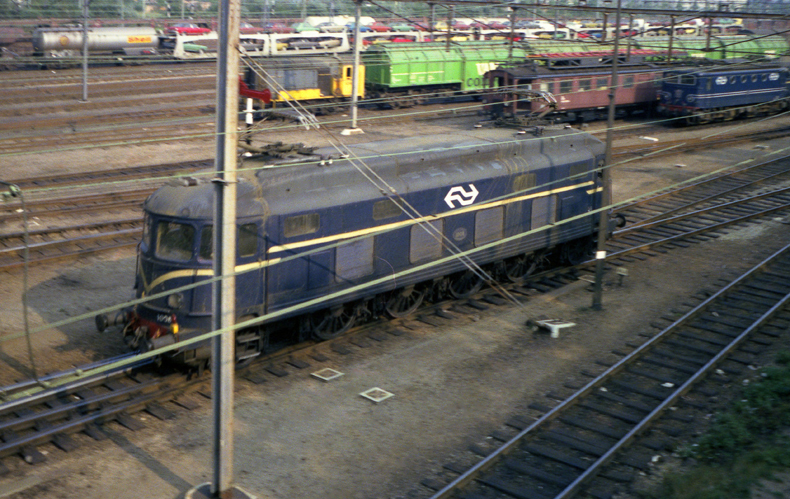 The Dutch Railways (NS, Nederlandse Spoorwegen) were quick to adopt electric traction. In the early twenties an electrification scheme was drawn envisaging the demise of steam halfway the forties. After swift take off in the twenties the electrification program was slowed by the economic downturn. The Second World War destroyed much what had been built up so far and the postwar priorities gave steam a little respite. But as soon as the railway got up and running again electrification regained its momentum and the last scheduled steam services ended in Dec 1957. The Netherlands was the first country in the world to end steam. In the twenties electric traction was exclusively in the form of electric trainsets for passenger transport. Goods trains and heavy passenger trains which required locomotive power were still steam hauled. The development of suitable electric locomotive lagged behind expectations. So much so that the Dutch railways reluctantly developed and ordered new steam locomotives to satisfy the needs of the motive department. By the end of the thirties thoughts turned to developing an electric locomotive. Several drafts were made based on the general conviction that fast and strong electric locomotive had rigid frames. 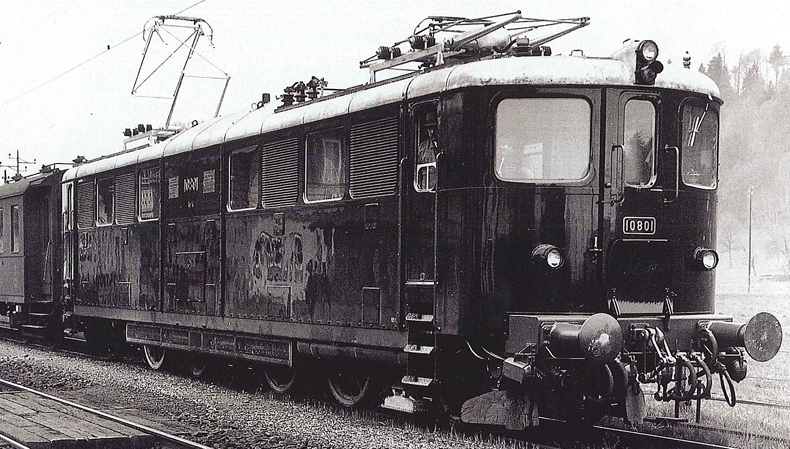 Well known examples of that concept were the German E18 and the Swiss BLS Ae 6/8. The design bureau of the Dutch Railways envisaged a 1'D1' locomotive for 160 kmh. Even during the second world war development continued resulting in an order in 1942 which due to the war could not be fulfilled. After the war developments were continued as soon as the most urgent needs were dealed with. Despite test rides on the excellently designed BLS Ae 4/4 and the stream of negative signals about the poor performance of the SBB Ae 4/6 NS quite incomprehensibly the NS chose to adhere to the by then completely obsoleted concept of the rigid frame locomotive. Moreover the new locomotive's design was a straight derivation of the Ae 4/6. The new class 1000 appeared in 1947 and 1948. 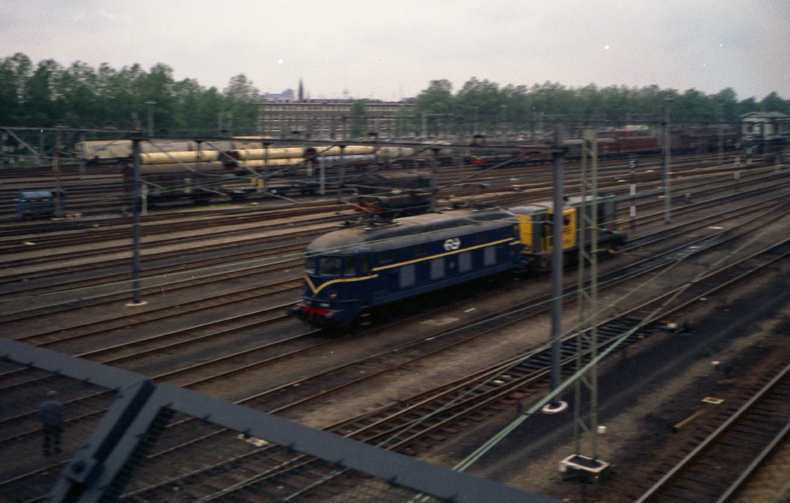 The first three locomotives were built by SLM, the remaining seven by Werkspoor. Though apparently a 1'D1' the actual wheel arrangement was (1A)'Bo(A1)', so the first driving axle and the running axle on either side were mounted in a bogie subframe and only the middle two driving axles were in the rigid mainframe. Every driving axle was powered by two motors. After an initial period of enthusiasm and admittedly some success in passenger service problems started. The engines rode extremely hard on the rails and proved to be prone to breakdown and other failures. Hot axle boxes, broken axles, broken wheel spokes, troubles with transmission, the list was long. Because of their uneasy riding their top speed was reduced to 100 km. After the influx of the classes 1100, 1200, and 1300 their days in regular passenger service were over by 1954. They earned their bread as freight locomotives, a duty for which they were designed nor suited. Being a small class which required a high level of maintenance and sharing only relatively few components with the highly standardised classes 1100, 1200 and 1300 they were a headache for the maintenance department. The last 1000's were withdrawn in 1982. A somewhat blurry picture I made in 1974. An unknown 1000 in the Rotterdam Fyenoord shunting yard. Two years later I shot the 1004 from the other side of the same bridge. As I am a steam addict I usually give little attention to electric locomotives. I incidentally stumbled upon this Roco model and bought for €90 in 2014. I bought it because there are only two classes of electric locomotives that are truly Dutch design, although even that can be disputed with the 1000 being of clearly Swiss origin and the 1200 of clearly American origin. Yet no other examples have been built anywhere else then in the Netherlands. All other classes, 1100, 1300, 1500, 1600, 1700 are variants of existing French or English designs. The version I bought is a reasonable depiction of the loco. The curved front is captured well. One day I will add the detail parts that were supplied in plastic bags.